Neverland memorabilia and souvenirs are among the most rare and sought after official collectibles by Michael Jackson collectors. Browsing the MJJCollectors.com web site you will find dozens of unique Neverland items in categories including Stationery, Accessories, Paper Items, Novelties, Linens, and Clothing such as Shirts and Hats. If you had any of this memorabilia in your Michael Jackson collection, you should consider yourself to be very lucky! Perhaps the rarest and most valuable of all of the Neverland memorabilia is this official Neverland Valley Ranch lunchbox. 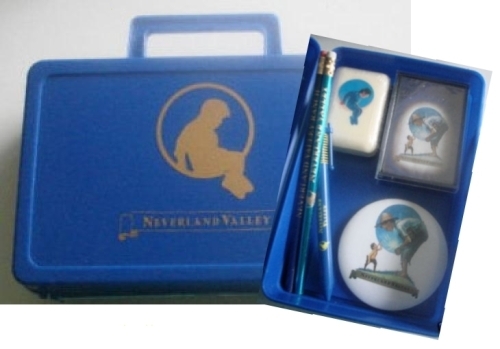 It often contained a Neverland stationery gift set including writing pads, pencils, pens, playing cards, stickers and official Neverland buttons. If the lunchbox is in mint condition and includes the original contents, it could be worth upwards of $1000! Located in Los Olivos, California, Michael Jackson's Neverland Valley Ranch was a happy place where children and fans could forget about their troubles for a day and enter a world filled with smiles and imagination. On September 13th, 2003, Michael Jackson held a special fan appreciation day at Neverland Ranch called the "Once In A Lifetime Event". Lucky fans received an invitation card and special "Golden Ticket" which gave you entry to Neverland on that day. When first arriving, Neverland visitors were often treated with a small gift bag that would include things like a daily itinerary, a Neverland Valley Ranch Map And Key, and a Neverland Lunch and Dinner Menu. Once inside, guests could go on the amusement park rides, visit the animals, ride on the "Katherine" steam train, walk around the Neverland grounds, play arcade games, or see what was playing at the Neverland Theater which often featured Michael Jackson movies or videos such as "Thriller," "Captain EO", "Moonwalker" or "Ghosts". Often Michael would give private tours of the property and even his personal residence. Imagine walking through the gates of Neverland and handed a balloon or a lollipop as you receive a private tour...from the "King Of Pop" Michael Jackson himself! Other gifts Neverland visitors occasionally received included a Neverland Valley Plastic Shopping Bag, a Wrist Watch, official Neverland Valley Playing Cards, frisbee, or a Tote Bag (to carry all of your Neverland goodies!). Some lucky fans even received Neverland T-shirts like this one which was hand signed by Michael Jackson! 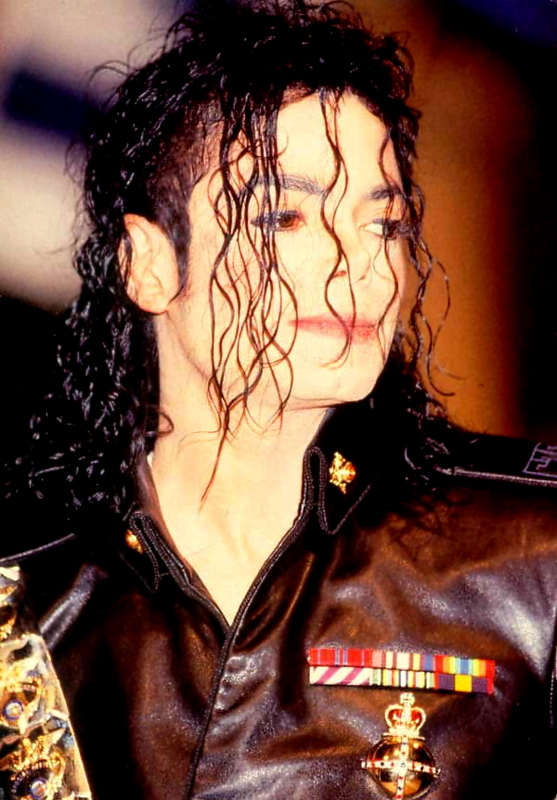 Obviously, such items are now worth several thousands of dollars each, and are among the most rare and sought after collectibles by Michael Jackson collectors. On very rare occasions guests were allowed to spend the night. Guest quarters at Neverland Ranch often came equipped with custom alarm clocks and drinking glasses, whereas the bathrooms had bath towels, wash cloths, and bars of hand soap, all with the Neverland "kid on the moon" logo that symbolized the innocence of children that Michael Jackson was known for. Occasionally former Neverland Ranch employees and staff have sold some of their belongings like this security badge worn by the "Neverland Office of Special Services", this Neverland Valley Fire Dept. Patch, this Neverland Ranch Security Uniform, and this Neverland Train Conductor Hat which is signed "Love Michael Jackson" in silver marker! As with any type of rare Michael Jackson memorabilia item, be careful of fakes and bootlegs! Like this Neverland Valley All Access Wristband often sold even by prominent celebrity auction houses and this ceramic Neverland mug. Each has the Neverland Valley "kid on the moon" logo, but they are easily reproduced by unscrupulous sellers looking to cash in on Michael Jackson collectors seeking official Neverland memorabilia. If you have or are considering to buy a Neverland collectible, feel free to email us and we will let you know if we think it is official memorabilia from Michael Jackson's Neverland Valley Ranch...or something only made to look like that ;-).